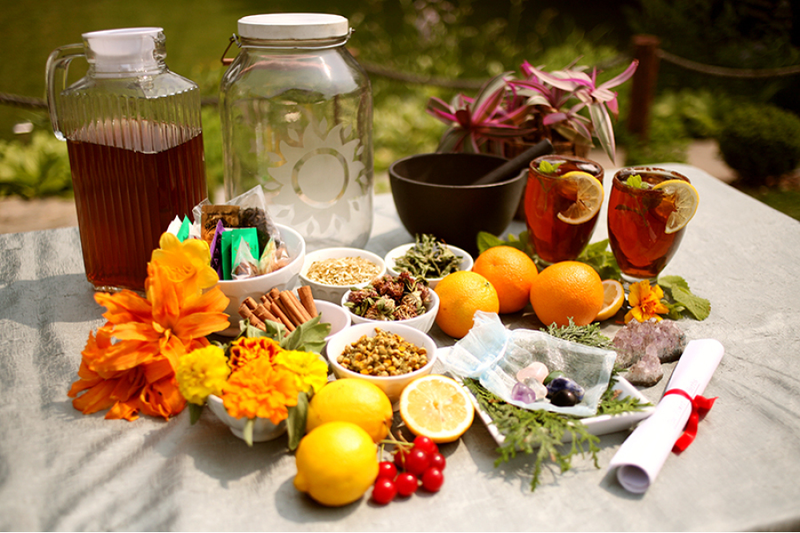 Brief Overview: Learn the fascinating art of preparing Sun Teas, Moon Teas and Gem Elixirs! You will discover the attributes of crystals to make powerful gem elixirs, and learn the health benefits of herbs. You will learn synergistic herb and crystal selection and the proper preparation techniques. In this 2 1/2 hour workshop we will teach you the fascinating art of preparing Sun Teas, Moon Teas and Gem Elixirs! You will discover the attributes of crystals to make powerful gem elixirs, and learn the health benefits of herbs. You will learn synergistic herb and crystal selection and the proper preparation techniques - all the "know how" necessary to do it yourself! Together we will create a flavourful, beautiful Sun Tea for everyone to sample and enjoy! NOTE: This workshop is a essential if you have previously taken an herb walk with us. The Sun Tea workshop allows you to immediately build on and apply your knowledge of herbs and plants and is highly recommended to expand your familiarity and expertise. -A concise informational scroll will ensure you always have the details. -Cinnamon sticks, star anise, calendula and of course, a fresh lemon! Don't delay signing up for this one.... Reserve your spot now!